Duncan Phyfe (1770-1854), known during his lifetime as the "United States Rage," to this day remains America's best-known cabinetmaker. Establishing his reputation as a purveyor of luxury by designing high-quality furniture for New York's moneyed elite, Phyfe would come to count among his clients some of the nation's wealthiest and most storied families. This richly illustrated volume covers the full chronological sweep of the craftsman's distinguished career, from his earliest furniture--which bears the influence of his 18th-century British predecessors Thomas Sheraton and Thomas Hope--to his late simplified designs in the Grecian Plain. More than sixty works by Phyfe and his workshop are highlighted, including rarely seen pieces from private collections and several newly discovered documented works. 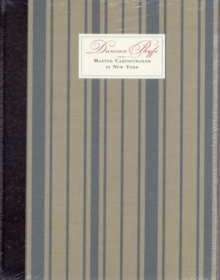 Additionally, essays by leading scholars bring to light new information on Phyfe's life, his workshop production, and his roster of illustrious patrons. What unfolds is the story of Phyfe's remarkable transformation from a young immigrant craftsman to an accomplished master cabinetmaker and an American icon. Pages: 312 pages, 343 color illus.